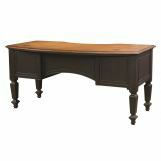 Ravenwood features a black rubbed finish and wirebrushed rich brown oak veneer tops. This ergonomic work space solution fits into every room. 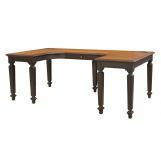 Warm traditional design will instantly create an inviting and richly styled home office to work comfortable. The Ravenwood Collection brings an exquisite traditional country style to life with the combination of beauty of a black rubbed finish and a wirebrushed rich brown oak veneer tops. Constructed from hardwood solids and white oak top veneers, this collection features ergonomically curved edges, reversible door panels, touch lighting for bright desktop space and a ‘Sit in the Zone’ ergonomically curved desk. 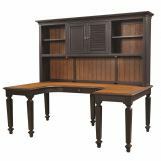 Ravenwood Collection will be a classy and elegant addition to your home and creates a sophisticated home office or library in your home.